Acacia Rigidula, iFAS50™ (Green Tea, Tuber Fleeceflower & Parasitic Laranthus), Adhatoda Vasica, Dandelion Root, Green Coffee Extract, White Willow (bark), Higenamine, NeluLean™ (Nelumbo Nucifera), Diiodotyrosine. Extended Release Caffeine (Caffeine Anhydrous & PharmaShure&re; XR Caffeine), Schizandra Extract Synephrin HCL, Hupwerzine A. Manufactured on equipment which possesses products containing milk, egg, soybeans, shellfish, wheat, and tree nuts. Gelatin, Microcrystalline Cellose, Magnesium Stearate & Titanium Dioxide. As a dietary supplement, assess tolerance during days 1 & 2 by taking 1 capsule in the morning on an empty stomach. After day 2 an additional cap may be added 5-6 hours loater if needed. Once tolerance is assessed, 2 caps may be taken at once with a 3rd 5-6 hours later. Never exceed 2 caps at once or 3 caps in a 24 hour period. Drink plenty of water during the day to avoid dehydration. Gelatin, Microcrystalline Cellulose, Magnesium Stearate, & Titanium Dioxide. As a dietary supplement, assess tolerance during days 1&2 by taking 1 capsule in the morning on an empty stomach. After day 2, an additional capsule may be added 5-6 hours later if needed. Once tolerance is assessed, 2 capsules may be taken at once with a 3rd 5-6 hours later. NEVER EXCEED 2 CAPSULES AT ONCE OR 3 CAPSULES IN 24 HR PERIOD. Drink plenty of water during the day to avoid dehydration. KEEP OUT OF REACH OF CHILDREN AND PETS. Consumer must be at least 18 years of age to purahcse and/or use this product. 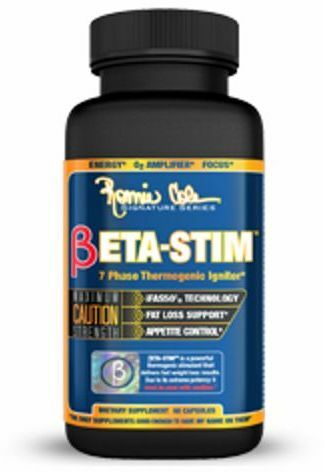 Prior to using BETA-STIM™ consult a licensed physician if you are unaware of your current health condition or have any pre-existing medical conditions including but not limited to high or low blood pressure, cardiac arrhythmia, stroke, heart, liver or thyroid disease, anxiety, depression, seizure disorder, psychiatric disease, diabetes, pernicious anemia, difficulty urinating due to prostate enlargement or if you are taking an MAO inhibitor or any other medication. Do not use if you are pregnant, nursing or contemplating pregnancy. 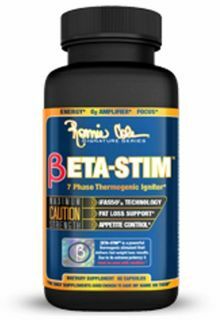 BETA-STIM™ SHOULD only BE USED BY HEALTHY ADULTS AGES 18-50. Discontinue use and consult your doctor if any adverse reaction occurs. Choline Bitartrate, L-Tyrosine, Extended Release Caffeine (Caffeine Anhydrous, & PharmaShure® SR Caffeine), Schizandra Extract, Synephrine HCL, Ginger Root Extract, & Huperzine A.
Acacia Rigidula, iFAS503® (Green Tea, Tuber Fleeceflower, & Parasitic Laranthus), Adhatoda Vasica, Dandelion Root, Green Coffee Extract, White Willow (bark), Higenamine, & NeluLeanTM (Nelumbo Nucifera), & Diiodotyrosine. Natural and Artificial Flavors, Citric Acid, Malic Acid, Sucralose, Acesulfame Potassium, & FD&C Red No. 40. As a dietary supplement, assess tolerance during days 1 & 2 by taking 1 scoop in the morning on an empty stomach. After day 2, an additional scoop may be added 5-6 hours later if needed. Once tolerance is assessed, 2 scoops may be taken at once. NEVER EXCEED 2 SCOOPS AT ONCE OR IN A 24 HR PERIOD. Drink plenty of water during the day to avoid dehydration. KEEP OUT OF REACH OF CHILDREN AND PETS. Not intended for use by persons under age 18. Do not exceed recommended dose. Do not use if pregnant, nursing or thinking about becoming pregnant. Do not take this product close to bedtime. Do not use if you are allergic or contraindicated to aspirin. Do not consume synephrine or caffeine from other sources, including but not limited to, coffee, tea, soda and other dietary supplements or medications containing phenylephrine or caffeine. Contains caffeine. Do not use for more than 8 weeks. Consult with your physician prior to use if you are pregnant or nursing, or if you are taking medication, including but not limited to MAO inhibitors, antidepressants, aspirin, blood-thinners, nonsteroidal anti-inflammatory drugs or products containing phylephrine, ephedrine, pseudoephedrine, or other stimulants. Consult your physician prior to use if you have a medical condition, including but not limited to, heart, liver, kidney, or thyroid disease, psychiatric or epileptic disorders, difficulty urinating, diabetes, high blood pressure, cardiac arrhythmia, recurrent headaches, enlarged prostate or glaucoma. Discontinue use 2 weeks prior to surgery or if you experience rapid heartbeat, dizziness, severe headache, shortness of breath or upset stomach. Store in a cool, dry place. Protect from heat, light and moisture. One thing that may be holding you back from looking your best is extra water between your skin making you appear puffy and not a defined as you really are underneath. The thermogenic activators on their own will help with excess water removal but the Dandelion Root in βeta-Stim rounds everything out. This ingredient has been used for years for its diuretic effects helping to flush out the excess water holding you back from your best look.